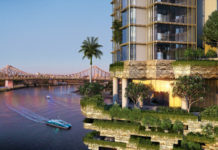 A development application has been submitted for a new 50,000 sqm 5-Star Green Star rated 40 storey commercial tower located at 360 Queen Street within Brisbane’s ‘Golden Triangle’. Proposed by a joint venture between Charter Hall and Investa Commercial Property Fund, the development proposes to remove four ‘tired’ and underutilised buildings of varying heights of four, seven, ten and eleven storeys high. A 615 sqm double-height landscaped terrace to be known as ‘the great verandah’ on level 13. The creation of a publicly accessible pedestrian arcade connecting Queen Street to Giffin Lane and Ely Lane. This arcade will be sleeved by fine-grained active tenancies. 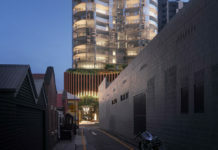 The pedestrian movement generated by the development and the active uses at ground level will contribute to the activation of these adjoining laneways. A publicly accessible plaza at ground level. This includes an outdoor amphitheatre capable of accommodating public events, entertainment and an outdoor cinema. Four basement levels accommodating 59 car parks, end of trip-facilities, and a 1,546 sqm supermarket. The building design embodies the principles of the New World City Design Guide: Buildings that Breathe. 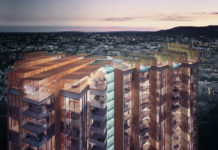 “Located on Queen Street the historical marketplace and financial heart of Brisbane, Queensland, the proposed development of 360 Queen Street is a beacon that is uniquely Queensland. A Beacon that is an expressive addition to Brisbane’s skyline seen in 360 degrees and significantly from the post card location – The Storey bridge. A Beacon for the “new” marketplace on Queen Street through a proposed architectural expression of eroded and porous podium levels. “Our concept epitomises the “Buildings that Breathe” principles which range from environmental technical performance, public realm engagement to vertical gardens and elevated outdoor spaces. − Open garden levels occurring at various levels. − A series of mixed- mode outdoor rooms through the tower levels, facilitating outdoor meetings and social interaction. The development will consider ways in which to use creative lighting throughout, particularly along the lower levels where the bulk of activity is. Roof lighting will also be provided, creating an iconic beacon within the city skyline. Major logo signage provision has also been included for the future anchor building tenant. In June 2017, Charter Hall and Investa Commercial Property Fund amalgamated the site for a reported price tag of $53 million. 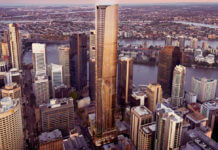 The final shortlist for Suncorp’s long-awaited new headquarters is a closely guarded secret, however, industry sources indicate 360 Queen Street joins Mirvac’s 80 Ann Street, Morris Property Group and Amalgamated Property Group’s 343 Albert Street and ISPT’s Regent Tower for the race to accommodate Suncorp’s new national headquarters. The development application number for this project is A004888198. Might be good, but 40 floors for that locale is a joke. This isn’t West end etc…it’s high rise cbd. It needs to be at least 60 floors. very good looking tower . 80 levels is what i think we should do. 40 level is too low for CBD. build a sky restaurant or a world class bar at the top. or 40 floors build some apartments to reduce the housing pricing in the city. or if they are loaded. offer free accommodation for the poor . there are heaps that are living in outer suburbs that want to enjoy a slice of city life.